* The products featured in this post were provided for a review. 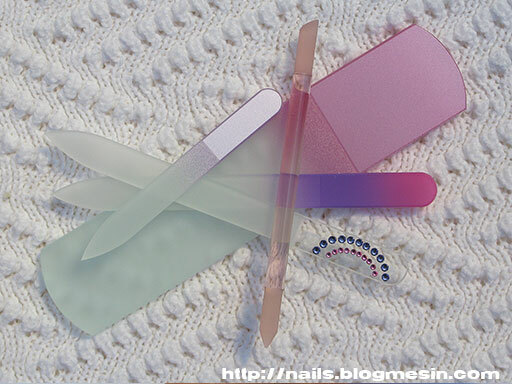 recently I got couple of Crystal Glass Nail Files sent to me for a review. 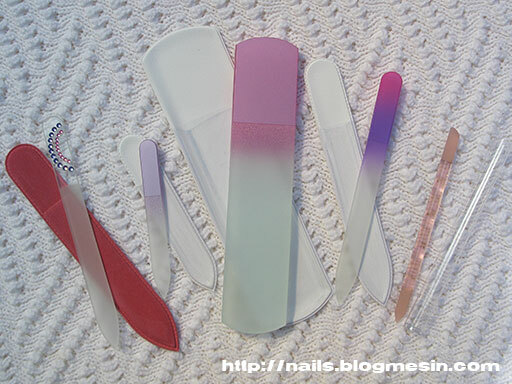 They are produced by Aveniro, a Czech company which is a manufacturer of handmade crystal glass nail files. 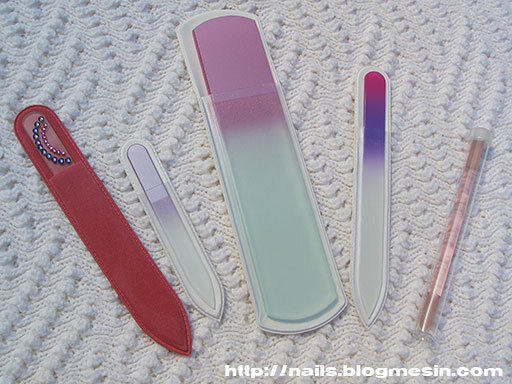 As you can see on the photo above these nail files came in different sizes, types and designs. My set contains a Coloured Glass Nail File, Small Coloured Glass Nail File, Glass Nail File with Rhinestones Design, Pedicure Glass Nail File and a Glass Manicure Stick. 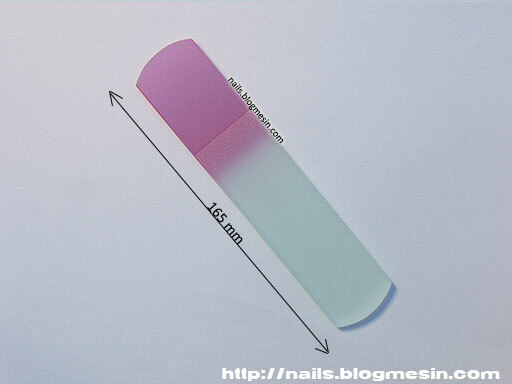 Glass Nail Files can be used both for natural and artificial nails. I have been testing them only on my natural nails so far. I read that the right produced glass nail files have really long lifespan and never wear off. They are gentle for the nails, grinding them softly and leave them smooth after the treatment. This one is 13,5 cm long, double sided with the equal grit and pointed ending. It has a nice colour gradient. I used it on my long natural nails to file them down. The abrasive surface seems to be very fine and gentle so I was surprised how fast it filed down the nails. My natural nails are very delicate and I must be carful to not destroy them during filing. 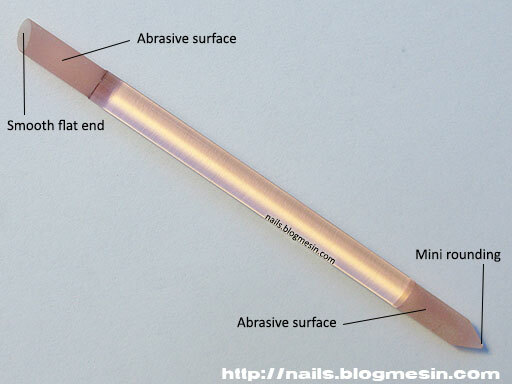 I usually move the nail file only in one direction from the side of a nail to the center. Moving a file back and forth is not good for the nails. My nails after filing had smooth edges without any splinters. I cannot say right now that using this files will benefit me with stronger, less brittle nails, but I can imagine that less tearing of the nail edges the better condition they are in. After filing all the ten nails the nail file was not clogged with nail dust so I didn’t need to refresh it after just couple of nails. This one is a smaller version of the previous one. It’s 9 cm long and easy to carry in a purse just in case of some nail accident. This file is a similar to the two mentioned above. The difference is that it is decorated with crystal stones. I am a huge fan of everything shiny so I pay attention to the quality of the rhinestones. Those here are really lovely. Shiny, nicely arranged and I don’t see any ugly glue residues around or under them so the nail file looks neat. This one came in a plastic velvet pouch which is much nicer than the standard plastic one. This file is a gentle foot scraper used for removing hard skin on the sole. It has a different roughness on each side. One side is coarser and is used for scrubbing the rough skin and the second is much smoother and is used for smoothening the skin after scrubbing. I exfoliated my feet with this pedicure file and I am happy with the effect. The file doesn’t tear the skin leaving it really soft and smooth. I would not use it for a very thick and difficult to remove skin, but rather for everyday feet care. The file is pretty heavy and sits good in the hand during the treatment. In the begining I was a bit worried that if I press it too hard to the heel it will break, but after using it twice I realize that the file is strong enough. I used it also to smoothens the thicker and rougher skin under my big toes. I am so happy with this file that I am going to use it regulary instead of my old foot scraper. On one side it has a grinding tip which can be use for cleaning under the nail when standard nail brush cleaning routine won’t help. The ending has a mini rounding on the tip so it is not sharp (I wouldn’t push any sharp tool under my nail). The other side of a stick is bevelled with the abrasive surface on its circumference and can be used as a cuticle pusher. For pushing back my cuticles I usually use orangewood stick or a metal cuticle pusher (which I reccommend only for those who knows what they are doing because this tool can be sharp and used incorrectly can make a demage to the nails and skin around) so I didn’t see the point of introducing new tool for that, but I tried it anyway and I must say that I already like this manicure stick. The flat end is smooth so it doesn’t scratch the nail surface during pushing back the cuticles and the abrasive part of an ending is gently scrubbing them without tearing delicate skin around the nail. Please remeber that when you push back your cuticles (using this or any another cuticle pusher) you should do it gently and not push it back all the way but leave a little bit of cuticle intact. During the 3 day test I was regulary washing this nail files after each use with warm water and a soap, drying them with a paper towels and finally sanitizing them with alcohol for sanitizing skin. Cleaning them was easy and effective. I was especially happy with cleaning the foot scraper because it is so much easier to clan it than the traditional pumice stone or a metal scraper which I regulary need to replace. In this case long life span of a scraper has sense, I wouldn’t keep for long a file which doesn’t wears off, but is difficult to clean. I was very harsh towards the nail file decorated with rhinestones. I was rubbing the stones with paper towel and sanitizing alcohol to see if they fall off or loose their shininess, but nothing bad happened to them and they still look like new. On the manufacturer webpage are certificates of health safety and solidity and mechanical resistance of their products. The first one proves that their glass nail files comply with hygienic standards and do not irritate skin and the second proves that they chemically hardened nail files are on average by 100 % more resistant than those which do not pass through chemical hardening process. I guess it means that their products are safe to use and durable. You can find out more about different glass nail types and some manicure tips at the producer webpage www.aveniro.com. * These free PR samples were sent to me for my honest review which I wrote based on my experience with using the products. Please note that this is my personal opinion about the product. I receive no additional monetary compensations. The link to the manufacturer website is not an affiliate link.